An expedition from England to Nairobi, Kenya. 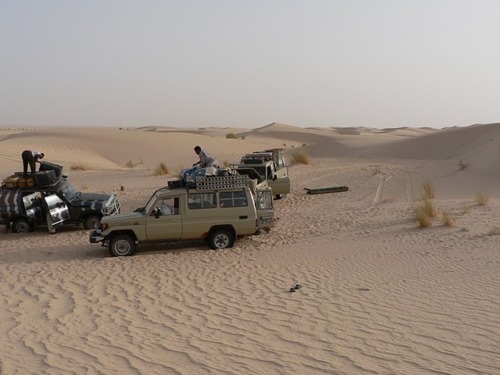 In 1974, we set off in three long-wheel based Land Rovers driving overland for 5 months. Our party of 12 comprised 9 young men and three women. Pam and I were the only married couple. Mostly graduate engineers from Loughborough University, led by Hugh Epsom. Hugh’s parents lived in Nairobi, so this trip was his way to return home. To me the opportunity to join the party was something I could not turn down. I was not as adventurous as some, but I knew if I didn’t go, it would be something I would always regret. Likewise, having gone, it is an experience that I will always cherish. Some of the best, and most challenging times of my life. The journey through the Sahara was the best, although there were other great times, that I will get to. Seeing a snake that had eaten a goat, waiting 3 days for a ferry that never came, and the long detour that resulted. Chatting to a young man before crossing a border, only to find him back in his uniform after lunch, in the Customs office!